For other uses, see Over the Garden Wall (disambiguation). Over the Garden Wall is an American animated television miniseries created by Patrick McHale for Cartoon Network. The series centers on two half-brothers who travel across a strange forest in order to find their way home, encountering odd and wonderful things on their journey. The show is based on McHale's animated short film Tome of the Unknown, which was produced as part of Cartoon Network Studios' shorts development program. The show features Elijah Wood and Collin Dean as the protagonists Wirt and Greg, and Melanie Lynskey as a bluebird named Beatrice. Over the Garden Wall was broadcast throughout the week of November 3, 2014 to November 7, 2014. The show marked the first miniseries on the network, which commenced its production in March 2014. McHale first envisioned the show in 2004, and pitched it to the network in 2006. After working on other Cartoon Network shows including The Marvelous Misadventures of Flapjack and Adventure Time, the network expressed interest in McHale pitching a pilot. That pilot became the catalyst for Over the Garden Wall. Production of the show was largely handled in Burbank, California, but many of the show's storyboard artists worked from other U.S. cities, while the program's animation was outsourced to Korean studio Digital eMation. The series' environment evokes 19th- and 20th-century Americana, while its digital backgrounds are designed to resemble grisaille paintings. Upon its debut, the series received critical acclaim from television critics, with praise focusing on its mood and characters. In 2015, the series won an Emmy Award for Outstanding Animated Program. Outside of the series, a one-shot comic book adaptation penned by McHale has been produced, with four further issues commissioned. This was eventually expanded into an ongoing series. The series follows two half-brothers, Wirt and Greg (voiced by Elijah Wood and Collin Dean respectively), who become lost in a strange forest called the Unknown. In order to find their way home, the two must travel across the seemingly supernatural forest with the occasional help of the wandering, mysterious and elderly Woodsman (Christopher Lloyd) and Beatrice (Melanie Lynskey), an irritable bluebird who travels with the boys in order to find a woman called Adelaide, who can supposedly undo the curse on Beatrice and her family and show the half-brothers the way home. Wirt, the older brother, is a worry-prone teenager who would rather keep to himself than have to make a decision. His three passions are the clarinet, poetry, and interior design, but he keeps this private out of fear of being mocked. On the other hand, Greg, the younger brother, is all about play and being carefree, much to Wirt's chagrin and the danger to himself and others. Greg carries a frog (Jack Jones), whose name is undetermined and who can communicate only through singing. Stalking the main cast is the Beast (Samuel Ramey), an ancient creature who leads lost souls astray until they lose their hope and willpower and turn into "Edelwood trees". In the final two episodes, it is revealed that Wirt and Greg are actually from the modern era. Wirt and Greg's strange appearance stems from the fact that the night they entered the Unknown was Halloween, and thus they were wearing costumes. Wirt, attempting to take back an embarrassing poetry tape he made for a girl he likes, had followed her to a graveyard scary story gathering before a police officer scared him and Greg into jumping over the cemetery's garden wall. On the other side of the wall, they landed on train tracks where Greg was almost hit by a train. Wirt pushed them both off a hill into a lake/river in an attempt to save him, knocking them both unconscious in the process and sending them to a Limbo-like realm between life and death. At the end of the last episode, Wirt and Greg wake up in a hospital, with Greg telling a story before being cut off. As the scene ends, Greg's frog begins to glow, due to having eaten a magic bell in the Unknown, suggesting that their experience in the Unknown may have been real. The series ends with a slow montage of how Wirt and Greg affected the inhabitants of the Unknown. 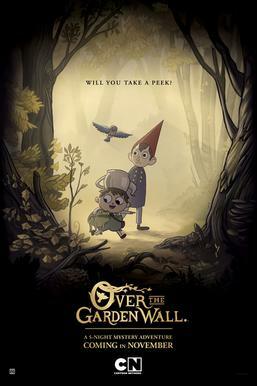 Over the Garden Wall was first envisioned in 2004 with a scarier and more adventure-based storyline. Before working as a storyboard artist on The Marvelous Misadventures of Flapjack, artist Patrick McHale pitched the show in 2006, then known under the title Tome of the Unknown. The series would follow two brothers—Walter and Gregory—who, after signing themselves into a Faustian deal with a devil named Old Scratch, journey across the Land of the In-Between to track down the pages of a book of forgotten stories. McHale saw it as "a possible Halloween special", but had trouble adapting the premise with a larger story arc. After his work for Flapjack, McHale moved on to co-develop Adventure Time, where he served as creative director, and subsequently as a writer. The network later asked him if he had interest in developing a pilot, which led to him returning to Tome of the Unknown, polishing it and pitching it again to the network. :29 After creating a pilot episode, Tome of the Unknown: Harvest Melody, McHale and the network settled upon the miniseries format for the ensuing series, as McHale felt that it would lead to "something that felt higher quality than what we could do with a regular series". McHale abandoned the original idea centered around chapters of a mystical tome and the series' title became Over the Garden Wall. Production for Over the Garden Wall commenced in March 2014. McHale initially envisioned eighteen chapters in the series, but the episode count was brought to ten to accommodate budget and time constraints. Early drafts of episodes from the show's pitch bible included a skinless witch character and a villain who carves dice from the bones of kidnapped children, as well a running plot throughout four episodes in which Wirt and Gregory are transformed into animals (Gregory being a duck and Wirt being "either a bear or a dog ... Nobody can tell which"). The ten episodes marked the first miniseries on the Cartoon Network. The show features Wood and Dean (reprising their roles from the short), along with Lynskey as the main voice cast. McHale and his crew tried to maintain a balance between frightening imagery and "episodes that are just light and funny". :24 For the music, McHale drew inspiration from "classic American, opera singing". Nick Cross served as art director and Nate Cash as supervising director; both worked with McHale alongside storyboard artists located in New York and Chicago. This distance proved difficult for McHale, who found it "particularly daunting considering the idiosyncratic nature of the production". The series' art was inspired by a variety of sources, including the 1890s McLoughlin Brothers board game Game of Frog Pond, illustrations by Gustave Doré for Cervantes's Don Quixote, old illustrations for the Hans Christian Andersen story "The Tinderbox", the Cheshire Cat illustration by John Tenniel from Alice's Adventures in Wonderland, and the "Dogville Comedies" short films. McHale referenced chromolithography, vintage Halloween postcards, magic lantern slides, and photographs of New England foliage to create the show's style. Greg and Wirt, two half-brothers who act as the miniseries' main protagonists, along with Beatrice the bluebird and Greg's pet frog. "Tome of the Unknown: Harvest Melody"
Wirt and Gregory grow tired of walking, so they borrow a car from a romantic songwriter made of vegetables named John Crops. They travel to a town of dancing vegetable people, unknowingly bringing crows and other dangerous animals along with them, but they manage to escape while John Crops finds a lover. Wirt and Greg, along with a frog that Greg attempts to name, are lost in a forest and are met by a talking bluebird and later a woodsman. They are informed by the old Woodsman that they are lost in the Unknown and warns them of "The Beast". Taking them to his oil mill, Wirt and Greg decide to stay for the night but problems arise when Greg leaves a trail of candy that a wolf, which they mistakenly believe to be the Beast, follows them. Greg knocks out the Woodsman, the two brothers run from the wolf, resulting in the destruction of the mill and the wolf being squeezed and returned to its original form, a dog. The Woodsman, angry at their actions but still forgiving, tells them to follow the path but warns them to beware the Beast, as he and the two brothers go their different ways. The brothers keep on rambling as they walk through the woods as a bluebird watches them in the trees. Beatrice, a talking bluebird, joins the brothers and their frog after they help her out of a bush. The trio arrive in a strange town, Pottsfield, that appears to be deserted. They find that the town is holding their annual harvest festival in a barn, which is disrupted by their arrival. The residents, who seem to be living pumpkins, sentence the trio to a few hours of manual labour. After being freed, the brothers decide to follow Beatrice to a woman named Adelaide, who she claims can help them get home. Wirt and Beatrice come across a school full of animal students being taught by a human teacher, Miss Langtree. She mistakes them for students and tells them to join the class, which Wirt does. Meanwhile, Greg and some of his new-found animal friends are chased by a gorilla and they hide in the school. Greg cheers everyone up by adding molasses to the potatoes that they're having for lunch. The next day, a benefit concert is organised for the school, which earns enough money to keep it open. Wirt trips over the gorilla, revealing that it was Miss Langtree's missing fiancé, Jimmy Brown, stuck in a costume. Wirt and Greg visit a tavern to ask for directions to Adelaide's house. The tavern people warn the brothers about the Beast and reveal that the creature turns people into trees of oil to burn in his lantern. Wirt steals a talking horse named Fred and finds Beatrice unconscious next to the Woodsman, and Wirt and Greg ride off with her. Meanwhile, the Beast reminds the Woodsman that the flame inside his lantern contains his daughter's soul, and that he must cut down Edelwood trees so the fire can keep her alive. Wirt and Greg claim to be the nephews of the wealthy and eccentric Quincy Endicott so they can steal two cents from him to pay for a ferry that will cross the river. In order to distract him, Greg, Greg's frog, and Fred convince Quincy to search for a ghost he supposedly saw one night. Beatrice reveals to Wirt she was once human, but she and her family were cursed by a bluebird. She explains that Adelaide is the only one who can change them back. Wirt reveals he has a crush on a girl back home named Sara. The groups reunite and discover that the ghost was in fact Quincy's neighbour and that their two mansions were actually connected. The two embrace each other and award Greg a cent each for his help. Wirt, Greg, Beatrice, and Greg's frog sneak aboard the ferry, which is filled with clothed frogs. They disguise themselves as a member of the ferry's band, which soon starts performing, with Wirt reluctantly playing a bassoon. Greg's frog unexpectedly starts to sing. When they arrive to their destination, Beatrice, who had been acting strangely throughout the ferry ride, tries to convince them to stay in the Unknown and not to visit Adelaide. That night, Beatrice flies away and is unknowingly followed by Wirt and Greg to Adelaide's house. Beatrice had originally planned to give them both to Adelaide as slaves in exchange for a pair of scissors that would lift the curse off herself and her family, but she had a change of heart as she grew attached to the brothers. Adelaide attempts to capture Wirt and Greg, but is killed by Beatrice. Beatrice attempts to explain the situation, but Wirt is hurt by her betrayal and runs away with Greg. Greg, Wirt, and Greg's frog encounter the Woodsman, who warns them that the Beast is ready to claim them. They run from the Woodsman and come across a lonely cottage in which they come across a young girl named Lorna who warns them to hide, as her care-giver Auntie Whispers is coming. Auntie Whispers uses a bell that can control Lorna with its ringing. Auntie Whispers reminds Lorna that she makes her constantly work so that "she won't become wicked". The brothers help Lorna to escape by helping her finish her housework early. Just before they leave, Greg and his frog accidentally awaken Auntie Whispers, who warns them to stay away from Lorna or they will be eaten. Lorna suddenly transforms into a horrific demon. Greg shakes his frog, who has eaten Auntie Whispers' bell, and Wirt commands the demon to leave Lorna's body and never return. Lorna decides to stay with Auntie Whispers. After leaving Lorna and Auntie Whispers, Wirt begins to lose hope of ever leaving the Unknown, which pleases the Beast who is watching from afar. The brothers and Greg's frog sail down a lake, where they hear the Beast's singing, and Greg remains hopeful while Wirt has given up. They reach land and sleep under a tree for the night. Greg has a dream of an angelic cloud city, where he is welcomed by its residents. The festivities are cut short when the North Wind is released and starts destroying the city, but Greg manages to defeat it. The Queen of the Clouds appears to Greg, allowing him one wish as a reward. He wishes to find his way home, but the Queen informs him he cannot return home with Wirt as the Beast has already claimed Wirt, who is covered in Edelwood branches. Greg instead wishes to take Wirt's place, and leaves with the Beast. Wirt awakens and chases after them, but falls through ice and nearly drowns before being saved by a fishing net. Taking place before the events of the first episode, on Halloween, Wirt has just finished making an audio cassette tape for his crush, Sara. He fashions a costume out of an old Santa Claus hat and a marching band cloak. Greg gives the tape to Sara's friends, who tell Wirt that he should hurry, because another boy, Jason Funderberker, was planning on asking her out at a party that night. Trying to retrieve the tape, they end up at the party. Wirt meets up with Sara, who invites him to go to the graveyard with her and her friends. He declines and tries to get the tape from her jacket. However, Sara comes back for it, leading Wirt and Greg to sneak after her and her friends. At the graveyard, the group is telling ghost stories when Greg tries to cause a distraction for Wirt. A police car pulls up and jokingly tells them off for being in the graveyard, but they take him seriously and run off, with Wirt and Greg scaling a wall at the edge of the graveyard. At the top, Wirt notices Sara finding the tape in her jacket and he panics. They jump off the wall and onto a set of train tracks on the other side. 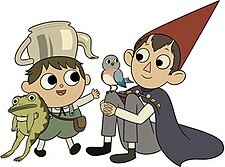 Wirt blames Greg and his stepfather for ruining his life, but Greg pays no attention and picks up a frog in the bushes. A train comes down the tracks, heading straight for them. Wirt and Greg jump out of the way, but roll down a steep hill and into a lake, knocking them both unconscious. Wirt then wakes up after the events of the previous episode, and finds himself in a nest with Beatrice's family. He thanks them and heads off with Greg's frog into a snowstorm to look for his brother. After leaving Wirt with her family, Beatrice navigates through the storm to find Greg, who she sees performing meaningless tasks for the Beast. She is whisked away by the strong wind and crashes into Wirt, who was wandering in the storm holding Greg's frog, and leads him to where she last saw Greg. As the sun sets, having used up what little Edelwood he had left, the Woodsman ventures into the woods and finds Greg transforming into a new Edelwood tree. The Woodsman attempts to free Greg before fighting the Beast away from the clearing as Wirt and Beatrice arrive. He asks Wirt to return his "rock fact" rock that he stole from Mrs. Daniel's garden for him once he is gone, to which Wirt refuses, and decides to name Greg's frog "Jason Funderburker" to cheer him up as he tries to break the Edelwood branches off. Wirt then sees the Woodsman knocked down at his feet as the Beast appears, offering to keep Greg's soul alive inside the lantern in exchange for Wirt taking over the Woodsman's duties in keeping it lit. Wirt is tempted to accept this offer, but he realizes that the flame within the lantern is actually the Beast's own source of life. After explaining this to everyone in the clearing, Wirt frees Greg and asks for Beatrice to come with them. But she declines as she wants to return home and admit to her family that she is responsible for their curse. Wirt gives Beatrice Adelaide's magic scissors, which Wirt had kept from their encounter, sheepishly admitting that he had kept them from her out of spite. They head off as the Woodsman, mortified to learn that Edelwood trees grew from the bodies of the lost and that he had never been keeping his daughter alive, resists the Beast's lies and extinguishes the lantern, ending the Beast's life once and for all. After Wirt and Beatrice say their goodbyes, Wirt wakes up under the lake and pulls Greg and his frog to the surface, passing out as the police and his friends show up. The brothers are taken by ambulance to the hospital. Wirt wakes up next to Greg, Sara, and her friends. Sara tells Wirt that she hadn't listened to the tape yet, as she doesn't own a cassette player. Wirt offers for her to listen to it at his house, which she accepts. Greg starts telling everyone about the events they had experienced, while revealing the magic bell is still inside his frog, confirming their stories. Back in the Unknown, the Woodsman is sitting on his porch in melancholy when his daughter comes out of his home, having come back to life along with the other lost souls. The other Unknown residents are shown to be living much happier lives as a result of Wirt and Greg's influence, including Beatrice and her family restored to human form. Greg's frog plays the piano and sings, and Greg returns the stolen rock back to Mrs. Daniel's garden. McHale's original short, Tome of the Unknown, was screened at the 2014 Santa Barbara International Film Festival, where McHale earned the Bruce Corwin Award for best animated short film. It also received an honorable mention at the 2013 Ottawa International Animation Festival. At the 2014 San Diego Comic-Con International, a preview of the show was screened along with various panels for other shows on the network. Episode 2 was previewed at the 2014 New York Comic Con, which McHale and the main cast attended. The show made its premiere on November 3, 2014 on Cartoon Network, and ran over five consecutive nights. The entirety of it was published on iTunes preceding its broadcast. The series aired on Cartoon Network in Australia from December 15 to 19, 2014 and on Cartoon Network in the United Kingdom and Ireland from April 6 to 10, 2015. Various melodies and songs based on pre-1950s music are heard throughout the series. Elijah Wood, the voice actor for Wirt, has said that "if this show were a record, it would be played on a phonograph". Songs from the series include "Into the Unknown", its title song, composed by Patrick McHale and sung by Jack Jones; "A Courting Song", composed by the Petrojvic Blasting Company and performed by Frank Fairfield; and "Come Wayward Souls", sung by Samuel Ramey as the Beast. The majority of the series' songs have been officially uploaded to YouTube. On the DVD release they can be heard, along with visuals and without dialogue, in a special feature known as the Composer's Cut. An extended version of the soundtrack, featuring 32 tracks and totaling around 44 minutes in length, was released in the form of a 180 gram vinyl record by Mondo in August 2016. The extended soundtrack debuted at the San Diego Comic-Con, with a limited 1,000 copies, featuring a cover designed by Sam Wolfe Connelly. The extended vinyl is also available as a webstore exclusive from Mondo. Over the Garden Wall (with the short film Tome of the Unknown) was released on DVD in Australia on July 8, 2015 by Cartoon Network and Warner Home Video and on September 8, 2015, in the United States. The DVD features all ten episodes of the show, commentaries, the original pilot, alternate title cards, and deleted animatics. Other extras on the DVD include a "Composer's Cut," an option wherein a viewer can watch the show with only the visuals and the background music; and the mini-documentary Behind Over the Garden Wall. On April 6, 2016, Madman Entertainment released the miniseries on Blu-ray exclusively in Australia and New Zealand with the same bonus content as the DVD release. Dark Horse Books published The Art of Over the Garden Wall (September 2017, ISBN 978-1506703763) by Patrick McHale and Sean Edgar. The book includes concept art, commentary from the show's creators, and interviews with the cast and crew. Over the Garden Wall was critically acclaimed. Preceding its premiere, Patrick Kevin Day of the Los Angeles Times called it "funny, creepy" and, from the premise, "not as simple as it sounds". In TV Guide and also before the premiere, Megan Walsh-Boyle felt that the show's fictional universe "sounds like a world worth getting lost in". :24 Meredith Woerner of io9 called a preview of the show "amazing", "weird, and cute and great", reflecting "all the things we love about this oddball animation renaissance we are currently living in". Conversely, Amid Amidi of Cartoon Brew judged from the same preview that the animation was lacking. While not discounting its storytelling, music, and production design, he felt that production skimped on animation; he was still looking forward to the series. Robert Lloyd of the Los Angeles Times wrote that it was "a little too folksy and fairy story" at times, but that its "contemporary strangeness wins out", and concluded that "it is throughout something to behold". Lloyd later wrote that it evoked "a kind of artisanal quality", both in its design and setting, and though the writing felt "a little too intent on its own folksiness", it became more enjoyable throughout. In the New York Times, Mike Hale also felt the writing was sometimes weak and the stories "perilously thin", but concluded that McHale developed an environment worth visiting. Brian Moylan of The Guardian wrote that the visuals were "absolutely stunning", and that the stories contained "a certain darkness to it that is both mellow and twee at the same time, with a fair amount of anxiety creeping around the edges". Brian Lowry of Variety wrote that Garden Wall was "an admirable experiment", but not one to sustain "the five-night commitment", calling it "slightly mismatched" while praising a departure from "the more abrasive characteristic" of the network's primetime content. Kevin McDonough of the Illinois Daily Journal criticized some of the writing, but summed it up as "an ambitious cartoon" for both younger and older audiences. Jason Bree of the website Agents of Geek called the miniseries "the greatest thing Cartoon Network has ever produced". Kevin Johnson, writing for The A.V. Club, praised the series, giving it an A, saying that "with such a perfect blend of mood, atmosphere, story, and characterization, Over the Garden Wall's 10-episode run will leave you wanting more, but like every great fairy tale, it's a story that knows when it's over." A one-shot comic book adaptation of the show was announced in October 2014. Produced by KaBoom!, an imprint of Boom! Studios, the comic was released on November 5, 2014. The comic was supervised by McHale and was produced as an oversized special. The comic was illustrated by Jim Campbell, a writer/storyboard artist on the television series. A special variant cover, by McHale, was also released. The success of the standalone comic led to further issues being commissioned in May 2015 and began to be released in August 2015. According to Patrick McHale, the comic books would be similar to the one-shot comic, detailing the events that occurred in between certain episodes and would expand on the television miniseries. The success of the series of one-shots led to an ongoing series of comics, serving as both a sequel and prequel to the series, rather than telling adventures that happened between episodes. The stories are told parallel, with half the comic detailing Greg returning to mysterious dreamlands in his sleep. The other half chronicles the Woodsman's daughter, Anna, and how she became lost in the Unknown. After the ongoing series ended in November 2017, the Over the Garden Wall comics continued as a series of miniseries and original graphic novels. ^ McHale, Patrick; Edgar, Sean (2017). The Art of Over the Garden Wall. Dark Horse Books. p. 33. ISBN 978-1-50670-376-3. ^ McHale, Patrick; Edgar, Sean (2017). The Art of Over the Garden Wall. Dark Horse Books. p. 13. ISBN 978-1-50670-376-3. ^ a b c d e Day, Patrick Kevin (October 5, 2014). "Lost in an animator's imagination". Los Angeles Times. Tribune Publishing. p. D12. Archived from the original on October 5, 2014. Retrieved January 15, 2017. ^ McLean, Thomas J. (Sep 14, 2014). "Rising Stars of Animation". Animation Magazine: 28–31. Archived from the original on October 12, 2014. ^ a b McHale, Patrick; Edgar, Sean (2017). The Art of Over the Garden Wall. Dark Horse Books. p. 67. ISBN 978-1-50670-376-3. ^ McHale, Patrick; Edgar, Sean (2017). The Art of Over the Garden Wall. Dark Horse Books. p. 15. ISBN 978-1-50670-376-3. ^ Andreeva, Nellie (March 7, 2014). "Cartoon Network Orders Over the Garden Wall as First Miniseries". Deadline Hollywood. Penske Media Corporation. Archived from the original on October 12, 2014. Retrieved October 11, 2014. ^ a b Walsh-Boyle, Megan (September 1–14, 2014). "Toon In". TV Guide. OpenGate Capital: 24–25. ^ McHale, Patrick; Edgar, Sean (2017). The Art of Over the Garden Wall. Dark Horse Books. p. 24. ISBN 978-1-50670-376-3. ^ McHale, Patrick; Edgar, Sean (2017). The Art of Over the Garden Wall. Dark Horse Books. p. 46. ISBN 978-1-50670-376-3. ^ McHale, Patrick; Edgar, Sean (2017). The Art of Over the Garden Wall. Dark Horse Books. p. 86. ISBN 978-1-50670-376-3. ^ McHale, Patrick; Edgar, Sean (2017). The Art of Over the Garden Wall. Dark Horse Books. p. 87. ISBN 978-1-50670-376-3. ^ McHale, Patrick; Edgar, Sean (2017). The Art of Over the Garden Wall. Dark Horse Books. p. 102. ISBN 978-1-50670-376-3. ^ McHale, Patrick; Edgar, Sean (2017). The Art of Over the Garden Wall. Dark Horse Books. p. 7. ISBN 978-1-50670-376-3. ^ a b "Monday Final Nationals: ESPN Continues Win Streak with 'Monday Night Football'". TV Media Insights. November 5, 2014. Archived from the original on November 10, 2014. Retrieved November 7, 2014. ^ a b "Tuesday Final Nationals: 'Masterchef Junior' Lifts Fox". TV Media Insights. November 6, 2014. Archived from the original on January 13, 2015. Retrieved November 7, 2014. ^ a b "Wednesday Final Nationals: 'CMA Awards' Gives ABC Dominant Victory". TV Media Insights. November 6, 2014. Archived from the original on November 20, 2014. Retrieved November 18, 2014. ^ a b "Thursday Final Nationals: NFL Network Proves Competitive with Broadcast Nets". TV Media Insights. November 7, 2014. Archived from the original on November 9, 2014. Retrieved November 8, 2014. ^ a b "Friday Final Nationals: CBS, ABC Share Night's Top Honors". TV Media Insights. November 10, 2014. Archived from the original on November 21, 2014. Retrieved November 13, 2014. ^ "2014 Award Winning Films Announced". Santa Barbara International Film Festival. February 9, 2014. Retrieved October 11, 2014. ^ Zahed, Ramin (September 22, 2013). "Tito on Ice, Lonely Bones Win Ottawa's Top Honors". Animation Magazine. n.p. ^ Milligan, Mercedes (July 28, 2014). "Cartoon Network Teases Over the Garden Wall". Animation Magazine. Archived from the original on October 12, 2014. ^ Milligan, Mercedes (September 22, 2014). "Cartoon Network Plans Surprise-Packed NYCC Panel". Animation Magazine. Archived from the original on October 13, 2014. ^ Weinstein, Shelli (September 30, 2014). "Cartoon Network Sets Premiere for Miniseries Over the Garden Wall". Variety. Penske Media Corporation. Archived from the original on October 12, 2014. Retrieved October 11, 2014. ^ Davis, Lauren (October 31, 2014). "Watch the First Episode of Cartoon Network's Over the Garden Wall". io9. Gawker Media. Archived from the original on November 8, 2014. Retrieved November 8, 2014. ^ "GET LOST IN THE UNKNOWN OVER THE GARDEN WALL" (Press release). Sydney: Turner Broadcasting System. October 8, 2014. Retrieved January 16, 2017. ^ "Cartoon Network UK April 2015 Highlights". RegularCapital: Cartoon Network International News. Turner Broadcasting System Europe (Press Release). ^ a b Polo, Susana (3 November 2014). "An Interview With the Folks Behind Cartoon Network's Over the Garden Wall, Premiering Tonight!". The Mary Sue. Retrieved 20 September 2016. ^ a b Maas, Emily (21 October 2014). "Video: Creating the Soundtrack for Cartoon Network's Over the Garden Wall". TV Guide. Retrieved 24 April 2016. ^ PenzeyMoog, Caitlin (8 July 2016). "Mondo exclusive: An Over The Garden Wall soundtrack is coming in August". The A.V. Club. Retrieved 20 September 2016. ^ Shiach, Kieran (8 July 2016). "Mondo to Debut 'Over the Garden Wall' Soundtrack Vinyl at San Diego Comic Con [SDCC 2016]". Comics Alliance. Retrieved 20 September 2016. ^ a b "Over the Garden Wall Original Television Soundtrack!". Mondo. 8 July 2016. Retrieved 20 September 2016. ^ "Over the Garden Wall on DVD-Video from EzyDVD.com.au". EzyDVD. Retrieved July 21, 2015. ^ "Cartoon Network: Over the Garden Wall". Amazon.com. Retrieved July 20, 2015. ^ McHale, Patrick (Creator, Writer) (September 8, 2015). Over the Garden Wall (television miniseries). United States, South Korea: Cartoon Network. ^ "Over the Garden Wall Blu-ray". Blu-ray.com. 2016. Retrieved September 15, 2017. ^ "Art of Over the Garden Wall HC :: Profile :: Dark Horse Comics". www.darkhorse.com. Retrieved 2019-02-26. ^ Woerner, Meredith (October 13, 2014). "Over the Garden Wall Preview Is Crushingly Charming and Batshit Insane". io9. Gawker Media. Archived from the original on November 8, 2014. Retrieved November 8, 2014. ^ Amidi, Amid (October 13, 2014). "6-Minute Preview of CN Mini-Series Over the Garden Wall". Cartoon Brew. n.p. Archived from the original on November 8, 2014. Retrieved November 8, 2014. ^ Lloyd, Robert (October 31, 2014). "TV Picks: Powerless, Craft, Who, PuppyCat, Garden Wall". Los Angeles Times. Tribune Publishing. Archived from the original on November 8, 2014. Retrieved November 8, 2014. ^ Lloyd, Robert (November 3, 2014). "Over the 'Wall', a land of enchantment". Los Angeles Times. Tribune Publishing. p. D3. Archived from the original on November 8, 2014. Retrieved November 8, 2014. ^ Hale, Mike (November 2, 2014). "In a World of Whimsy, a Perilous Journey Home". The New York Times. The New York Times Company. p. C3. Archived from the original on November 8, 2014. Retrieved November 8, 2014. ^ Moylan, Brian (November 3, 2014). "Over the Garden Wall: slapstick for the kids, existential dread for the adults". Guardian. Guardian News and Media Limited. Archived from the original on November 8, 2014. Retrieved November 8, 2014. ^ Lowry, Brian (October 31, 2014). "TV Review: Cartoon Network's Over The Garden Wall". Variety. Penske Media Corporation. Archived from the original on November 8, 2014. Retrieved November 8, 2014. ^ McDonough, Kevin (November 3, 2014). "Tune in tonight: Grimm tidings on Cartoon Network". Daily Journal. Retrieved November 8, 2014. ^ Jason Bree (4 November 2014). "Over the Garden Wall is the Best Thing That the Cartoon Network Has Done - Review". Agents of Geek. Retrieved 1 December 2016. ^ "Review: Over The Garden Wall". The A.V. Club. November 7, 2014. Retrieved December 6, 2014. ^ a b "42ND ANNUAL ANNIE AWARDS CATEGORIES AND NOMINEES". annieawards.org. Archived from the original on 14 December 2014. Retrieved 14 December 2014. ^ "Reuben Awards Winners 2015 Categories". The National Cartoonists Society. Retrieved May 29, 2014. ^ a b "Creative Arts Emmy Awards Winners" (PDF). Television Academy. Retrieved September 12, 2015. ^ McLean, Thomas J. (October 10, 2014). "Roundup: Rig a Zombie, Learn from Stoopid Buddies". Animation Magazine. Archived from the original on October 12, 2014. ^ Brown, Tracy (May 13, 2015). "Exclusive: Pat McHale announces 'Over the Garden Wall' comic book series". Los Angeles Times. Tribune Publishing. Retrieved January 5, 2016. ^ Collins, Elle (January 4, 2016). "KaBoom Announces Ongoing 'Over the Garden Wall' Series". ComicsAlliance. Archived from the original on June 23, 2016. ^ "Boom! Studios announces Over the Garden Wall: Hollow Town". Boom! Studios. ^ "Over the Garden Wall returns with DISTILLATORIA graphic novel this November". The Beat. 2018-02-22. Retrieved 2018-02-22. ^ "Your First Look at OVER THE GARDEN WALL: DISTILLATORIA from BOOM! Studios & Cartoon Network". BOOM! Studios. 2018-07-27. Retrieved 2018-11-03. ^ "Boom! Studios announced new Over the Garden Wall original graphic novel in October 2019". Boom! Studios. Willsey, Kristiana (2016). "'All That Was Lost Is Revealed': Motifs and Moral Ambiguity in Over the Garden Wall". Humanities. 5 (3): 51. doi:10.3390/h5030051. This page was last edited on 7 April 2019, at 04:54 (UTC).